It&apos;s beginning to look a lot like Christmas at the Capitol. 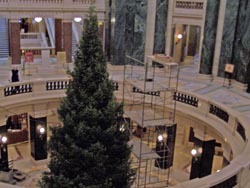 Crews have started putting up the state&apos;s official holiday tree. Capitol Building Supervisor Bill Beckman says it will be a big attraction through New Years, with thousands of people expected to come through to see the tree. There will be lots of lights on the tree this year, with crews stringing over 2,400 LED lights. The theme of this year is "Birds of Wisconsin," and it wil be decorated with bird ornaments made by school kids from around the state. This years&apos; tree is a 35-foot balsam, from private property in northwestern Wisconsin.